Every parent knows night time is very difficult to go through easily. It is quite a challenge to put your kids into the bed and make them stay there. Even though it is a hard work, but it is one of the most important things you need to do. If a child does not get enough sleep, he has a harder time controlling his emotions. They may be irritable or hyper, which is no fun for anyone. Kids who are always sleep-deprived are more likely to have behavior problems, have trouble paying attention and learning. So although it is not easy, it is important to do all you can to help your child get the sleep he needs. There are no simple rules for bedtime because every child is different. What is important is to build a routine that works for your family and to stick with it. Perhaps these tips will help you to make that schedule. Set a going to bed and waking up times for the entire family and be sure to follow them. You can tell that children are getting enough sleep when they fall asleep in 15 to 30 minutes after going to bed, when they wake up easily in the morning and do not nod off during the day. Very important thing is to discuss and agree on a sleep strategy for your child with your partner before and work together as a team. If you are starting a new sleep routine for your child, make him a part of the team by explaining the new plan to him if you kid is old enough to understand. Consistent nighttime routine improves sleep in children who have mild to moderate sleep problems. 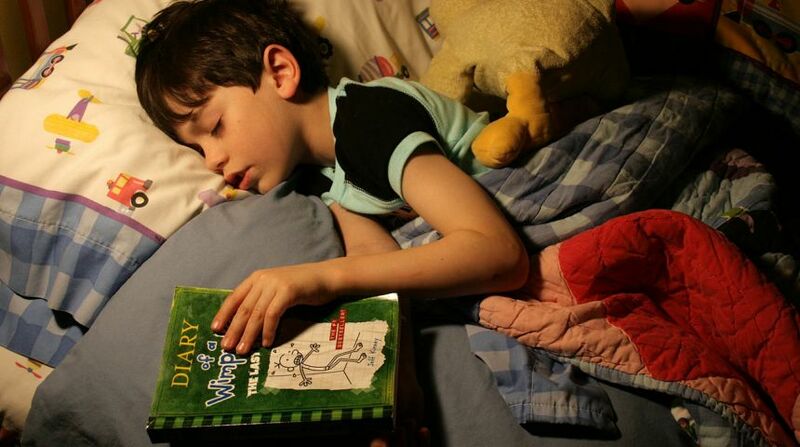 It helps the little one to learn to be sleepy, just like reading in bed often puts adults to sleep. It can also make bedtime a special time. That should help a child associate the bedroom with good feelings and give him a sense of security and control. There is no single routine that is right for every single person, but in general, yours routine should include all the things that your child needs to do before going to sleep, which includes brushing teeth, washing up, putting on pajamas and having a glass of water. Your child might want to read a book with you, talk about the day or maybe even hear a story. Whatever you choose to do, keep the routine pretty short and be firm about ending it when it is the time to sleep. It is a fact that everyone sleeps better in a room that is cool, not too cold but not too hot. A rule of thumb is to dress your child basically as you dress yourself, keep in mind that very young children often kick off the covers at night and cannot cover themselves, but it does not mean you have to dress them as it would be winter inside. Make sure the bedroom is dark and quiet and the noise level in the house is low enough. If your child does not like a totally dark room, just turn on a small night light or leave the hall light on and the door to the bedroom open. Point is, make sure your child is happy with the room atmosphere. Bedtime means separation and that can be easier for kids with a personal object, like a teddy bear or blanket, thing that reminds them of safety, love. It can provide a sense of security and control that comforts and reassures your child before he falls asleep. There is no doubt your kid will want for one last thing, like a hug, a drink of water or a trip to the bathroom, perhaps just one more book. Do your best to head off these requests by making them part of the bedtime routine. Just let your little one know that once he is in bed, he has to stay in bed.